Not content to rock gamers in February and March with Street Fighter IV and Resident Evil 5, Capcom just signed a deal to slap their characters on debit cards. The co-branded Visa debit card is the first of its kind in North America. 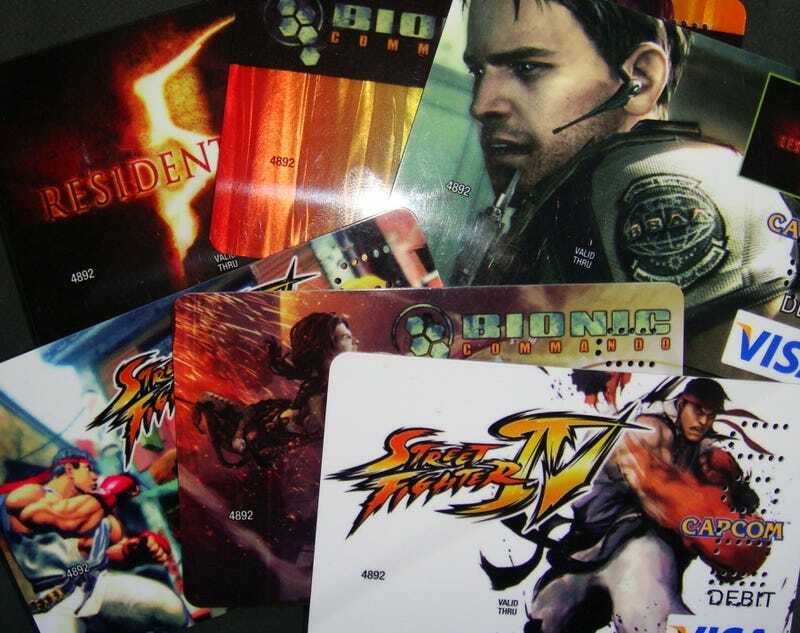 The cards will feature art from Street Fighter IV, Resident Evil 5 and Bionic Commando. The pre-paid cards will also let gamers earn points on Capcom-Unity.com, cash back from online or retail purchases and earn "accelerated rewards" through the online Capcom rewards mall. For every dollar deposited on the card they will earn five Capcom Unity points which can be used for a number of things on the site, including auctions and raffles. Unity card holders will also be able to "jump the line" at Capcom events or gatherings, gain access to Beta tests and other things like "being written into a Capcom game or comic book or possibly even being an extra in a Capcom movie. Wow, I sure hope they don't use this program to fill all of their creations with debit-crazed gamers. Still, I kinda like the Street Fighter cards. I'm told that sign ups for the card should be live here soon.